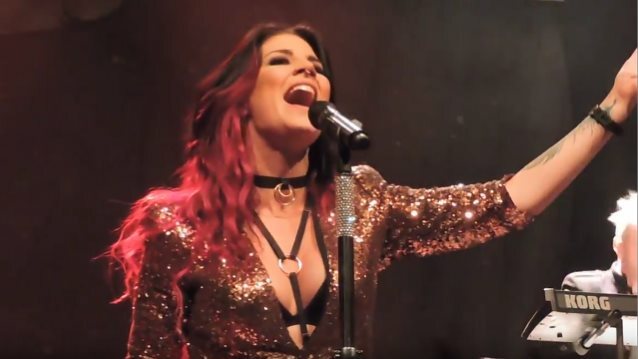 Lee Carter of Metal Wani conducted an interview with vocalist Charlotte Wessels and keyboardist Martijn Westerholt of Dutch symphonic metallers DELAIN prior to the band's November 13, 2016 show at Koko in London, England. You can listen to the full chat below. A few excerpts follow (transcribed by BLABBERMOUTH.NET). Martijn: "It's been great. Actually, normally when we release an album we play a couple of songs [live]. Not all songs work as well live; some songs are just better on an album. In this case, we have seven-to-eight we play from the new album. We've never done that before. It works really well. It really blends into the set. We're really happy it has been received so well." Charlotte: "People are singing along so fast, so apparently they picked it up as well. The response is very cool." Martijn: "We hear people say, 'Play it over and over,' which, of course, is a compliment. Also seeing people enjoy it live, looking at them singing along, that gives energy. It's special together. You create magic. The crowd and the band. It's making it a special experience." Martijn: "That's a good question." Charlotte: "I think we made a jumpstart here. We didn't release 'Lucidity' straight away. We started here with 'April Rain' and then after that…"
Martijn: "Actually, we started playing here pretty early on. Like the chicken and the egg! The label said, 'We don't want to release an album yet because we didn't play here.' And vice versa, but we said, 'Well, we want to play here.' Then it was 'We want to release it.' That's where it took off." Charlotte: "In a lot of the mainland [Europe], we had 'Lucidity', 'April Rain', then a quite a big pause to 'We Are The Others', but here we had 'April Rain', 'Lucidity', then 'We Are The Others' because we released them in a totally different order. Maybe it's also the attention span — it was a shorter period of time, we kept coming back very soon. I don't know if it has anything to do with it, but that's the only difference between U.K. and mainland in the way we release our albums." Martijn: "I think it's also a cultural thing, I suspect. The U.K. isn't Europe, it's not a continent. In the U.S., it's different as well. It's just a different country." Charlotte: "We get invited here to rock and metal radio stations. We don't even have that in the Netherlands. The culture for a lot of the music here is more accepted." Martijn: "Europe is more of a niche thing. We have a wonderful fanbase in Europe; Paris is always crazy. Germany goes really well. But it's different." Charlotte: "Lyrically, for the first couple of songs, they were all pretty pessimistic. They were all pretty dark and sad. That was a bit of a difficult point. I always saw myself that whenever you write about that stuff, there needs to be a light and there wasn't. At that point, we needed to decide, 'Okay, we are doing artwork and photo shoots, what it is going to be?' We decided to go for it and also put the label 'Moonbathers' and say, 'Even in a dark place, there can also be that comfort in the dark.' You can especially find it in the dark somewhere. I like to listen to sad songs. They make me feel sad and feel better. I hope it's something that fans can relate to, and eventually, there are a lot of really upbeat points on the album as well to counterbalance that." Martijn: "We aimed for having a lot of contrast. I always talk about contrast with the albums, but this time, I really pulled it off, greatly. There are really hard, heavy songs in there, sensitive ballads, and there's a rock song like 'Fire With Fire', so, but still, it's cohesive enough. I'm really, really happy how it turned out. That's what we aim for and is what we got. In this case, for us, it's about diversity. We want to diversity on the album and as I said, contrast." Charlotte: "I do think it's the most diverse album we've made." Martijn: "I agree. You never know, but you never know how it turns out. Creative juices and creative processes, what comes, comes. You can aim for something, but this was the exciting part of it. You can only aim production-wise. We did some new things, experimenting with recording, not in one go, but in different parts. Mixing a couple songs, then starting over, then recording a couple of other songs. It's a more modern approach, like with dance tunes. Write a song, mix it, release it, then go onto the next. With our case, we didn't release [it], but that's how mix it, then go to the next. Then you can reflect on it later on: 'This turned out well,' or [if it] doesn't, of course you can tweak it. It's a different way of working, but it worked out really well." Martijn: "You're limited, because if you want to recreate everything like strings, violins, then we need an eight-piece orchestra here or something and people will have to pay five thousand pounds to cover everything. I think it's also the guitar part and bass part, the heaviness, the bombastic part is so important is that it's not all about the symphonic elements. It's part of it, but it's not everything. We also have synth stuff and electronic elements in there as well, and that's very easily done live. Of course, we have stuff playing along, or it's just not possible. It's also important to have a good sound engineer. It just works really well live." "Moonbathers" was released on August 26 via Napalm Records.